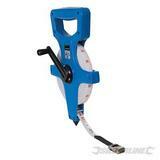 Heavy duty fibre surveyors tape with metric and imperial graduations. Strong plastic case with folding winding handle. Metal end hooks & claw. Water, scratch & crease-resistant PVC-coated tape. Class III accuracy.